Members of the Rolla Cherokee group display the materials they compiled for their application to become a federally recognized tribe. ROLLA, Missouri — The paperwork for Southern Cherokee’s application to become a federally recognized Native American tribe weighed 79 pounds. Members divided the forms into three boxes, posed for a picture, and shipped them to Washington for $105, plus $12.90 for a signature upon delivery. More materials, 26 boxes of genealogies and family trees, will soon follow. “It’s going to open some eyes,” said Steve Matthews, the group’s leader. Fifteen years ago, members of the Southern Cherokee Indian Tribe — the group’s official name — began researching their ancestry and heritage. Finally, after years of compiling materials, in early May of this year, the group’s 484 members reached the end of the first step of the tribal recognition process. Also called the acknowledgment process, it determines who is or isn’t a Native American tribe in the eyes of the federal government. Being granted tribal status gives a group access to federal funds, to the legal processes to obtain land and water rights, to tribal sovereignty, or self-governance, and to the right to define what indigenousness means. Although there is no universally agreed-upon opinion about federal recognition, benefits do include an immediate financial infusion. Through the Bureau of Indian Affairs, the New Tribes Program gives tribes with fewer than 1,700 members $160,000 a year for a period of three years. If the Southern Cherokee receive federal aid, Matthews said, they would use it to address health problems within the community, and to fund heritage preservation and education. But unless they are federally recognized, they’ll never see a dime — and even under new regulations, which went into effect on June 29, it could take years before that happens. In Missouri, there are nearly 30,000 American Indian and Alaska Natives, according to the 2010 Census. Although some belong to federal and state-recognized tribes, none of these groups are legally headquartered in Missouri. If their paperwork is approved, the Southern Cherokee Indian Tribe could become the first one. The only question is whether their story will stand up to scrutiny. Traces of Missouri’s first peoples are scattered throughout the state. Osage Beach, a town on Lake of the Ozarks, was named after the Osage Indians before they were edged into Oklahoma. Chillicothe, a 10,000-person town in northwest Missouri now perhaps more famous as the home of sliced bread, was named after the Shawnee, who had their own “chillicothe,” or big town, nearby. The name of the state itself is indebted to the Missouria Indians. When Wilcox and Matthews’ generation decided to take up the cause of recognition, their parents didn’t like it. Some were wary that just being a member of a tribe might mean that they would all be relocated to Oklahoma. The majority of the 566 tribes officially recognized in the U.S. never had to go through the recognition process. Their origins were established long ago via policy decisions, lawsuits and treaties with the government. Those who have gone through the process have often found it, as the Southern Cherokee do, monumental, overwhelming and expensive. From 1978, when the Bureau of Indian Affairs implemented its previous standard, to this year, when the new system was put into place, there were 316 petitioners. Only 51 managed to complete the application, and just 17 were “acknowledged as an Indian tribe within the meaning of Federal law.” The other 34 were denied. Even tribes with documented historical lineages have taken decades to be acknowledged: The Mashpee Wampanoag, who greeted the Pilgrims in Massachusetts in 1620, waited 29 years before they were federally recognized in 2007. The new guidelines will make it easier to obtain recognition. Under the revised criteria, only 80 percent of a group’s members have to be descendants of a historical tribe (instead of 100 percent); and only 30 percent need to maintain an active community (instead of a “predominant portion”). Tribes that have already been rejected won’t be able to re-petition. Luckily for the Southern Cherokee, the new standards will not force groups currently in the middle of the process to start over. Not everyone is pleased about the reforms. Some politicians fear incursion from the casino industry if more petitioners are acknowledged. Then there are financial limitations: the more tribes there are, the less the federal government can assist each one. Recognized tribes also worry about diluting tribal sovereignty and the meaning of being Native. Principal Chief Bill John Baker of the Cherokee Nation of Oklahoma, for example, worries that groups with “loose citizenship requirements” might have an easier time becoming tribes. Baker, like many tribal leaders, fears imposter groups may undermine the power and legitimacy of recognized tribes. Differences between the Cherokee Nation of Oklahoma and the Southern Cherokee, for example, are reflected in the records they use to evaluate members — preferring certain records over others means privileging a specific interpretation of the past. For Cherokee Nation, the Dawes Rolls, which were kept from 1898 to 1914, are the most important. Signing the Rolls was necessary to receive a land allotment during a period when the federal government was attempting to break up reservations. Members of the Southern Cherokee, Matthews is proud to say, never joined the 101,000 Dawes signatories. Instead, Southern Cherokee membership is based on the Tompkins Roll, a census of Cherokee living in Oklahoma in 1867, and on the muster rolls of Stand Watie, a Civil War brigadier general who is viewed as one of their founding leaders. Still, these records don’t clarify what makes a tribe and when exactly a new one forms. For example, several Southern Cherokee groups claim the 1834 Treaty of New Echota, which led to the Trail of Tears, as their founding document. The treaty was signed by Major Ridge, a minority leader in the Cherokee tribe, amid pressure from the federal government to sell Cherokee land in what is now Northwest Georgia and parts of the southeast. The treaty deeply angered Cherokee Principal Chief John Ross and his followers, who had wanted to sell the land for a better price. This led to deep divisions between the groups, and after both resettled in Oklahoma, members of the Ross Party began to attack the Ridge Party and assassinate some of its leadership. When the Civil War came, Stand Watie, a confidant of Ridge, formed a military regiment and fought for the South, which is where the Southern Cherokee get their name. After the war, Steve Matthews said, some Southern Cherokee families moved to Missouri to escape Ross Party violence. The Rolla Cherokee hold meetings once a month at the Elks Lodge a little south of town. On a cold night last February only one door was unlocked. It opened into a long white hall with a disco ball and a drum set at one end, and a mounted deer head at the other. They spend a lot of time here reviewing birth and death records to trace individual members’ lineages back to their rolls. Other records — from letters to signatures in Bibles — are scrounged from handed-down papers and official repositories. 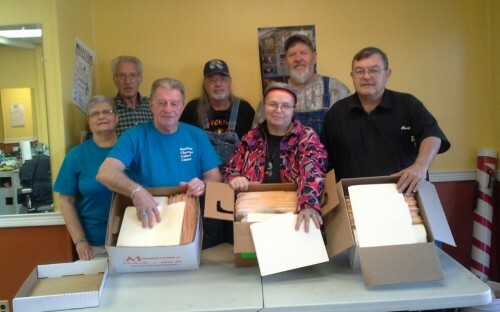 The group’s journal, which Steve Matthews kept from 1976 through 2004, will also help establish their history, but the Rolla Cherokee will try to bolster their claims with anything relevant they can find. No one knows if they have enough material. With the first part of their application finished, raising money to send the other 26 boxes of genealogies and ancestral charts is now the biggest challenge. All that weight is expensive, but they hope to send it in a month or so. As federal officials attempt to thread the needle between restricting predatory lending and ensuring that emergency loans remain available to America’s poorest, they’re trying to create a new and adaptable system of rules. But in one state, the traditional approach to payday lending is producing a strange public relations fight between lawmakers, a governor, Native American tribes, and a mysterious D.C.-based conservative PAC. Months after Connecticut regulators imposed a large fine on an unlicensed internet lender, a series of billboards showed up near the state’s highways accusing Gov. 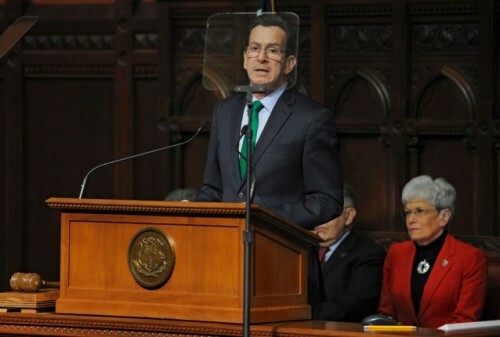 Dannel Malloy (D) of attacking the economic future of American Indians. The campaign made a big splash in a state that has two Indian-run casinos, and reportedly even featured a billboard in New York City’s Times Square. But nobody’s sure who is really paying for the billboards, and both Connecticut’s own tribes and the Otoe-Missouria insist they are not involved. Connecticut is one of 15 states that uses a low interest rate cap to effectively ban payday lending. But an online lender affiliated with the Oklahoma-based tribe found a way into the Nutmeg State anyway. The state responded with a $1.5 million fine, $700,000 of it charged personally to Otoe-Missouria tribe chairman John Shotton. A judge rejected the Otoe-Missouria’s argument that its tribal sovereignty prevented Connecticut regulations from applying to its corporate partners. It is the second time in the past couple of years that a court has found that borrowing a tribal group’s name and legal authorities does not give a payday lending company immunity from regulation. Such partnerships remain rare – just 63 out of more than 560 federally recognized tribes have opened payday lending partnerships – but they return a tiny proportion of lending revenues to actual Native Americans in exchange for the theoretically legal indemnity the partnerships afford to the businesses that make the real money. IFL President Andrew Langer told ThinkProgress the group has been following payday lending regulations “for a good 18 months now” and said their focus is on the sovereignty of the tribes involved in cases like the Connecticut one. “We think this tribe has a right to engage in this business, and we think the state of Connecticut has no legal authority to go after them,” Langer said. When the legal theory around tribally-affiliated lending evaporated in a Connecticut courtroom earlier this year, it set off a strange firestorm in the state that might end up further tightening Connecticut’s laws on the loans. “They deny that it’s the Koch brothers, for whatever that’s worth,” Lesser said. “You can sort of look at who benefits and draw your own conclusion.” The two national trade associations who have the most direct interest – the Native American Financial Services Association (NAFSA) and the Online Lending Assocation (OLA) – each emphatically denied involvement to ThinkProgress, with NAFSA’s spokesperson adding that the IFL campaign has “done more harm than good” to the Otoe-Missouria’s cause. 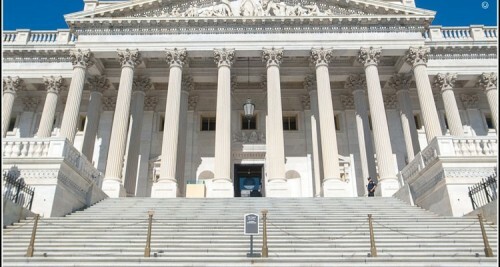 Enforcing rate caps like Connecticut’s can be important to protecting consumers, Pew Charitable Trusts small-dollar lending expert Alex Horowitz told ThinkProgress, but they’re not the only option. “Rate caps are important and states should continue to set them. If they don’t want payday lenders to operate in the state, they should set them at 36 percent or less,” he said. But a more flexible sliding rate cap system like the one in Colorado has kept credit available in emergencies and pushed average interest rates on the loans down to 115 percent – extremely expensive, but about a third of what unregulated states routinely see. The fallout from Connecticut’s decision is coming just as federal regulators are in the process of writing the first-ever national code for payday lending, auto-title lending, and other forms of expensive small-dollar credit. With its new regulations, the agency seeks to balance genuine consumer demand for emergency loans with the public interest in preventing the most predatory and abusive features of the traditional business model. While many states have taken Connecticut’s approach of preventing payday lenders from operating in any form, a handful of others have attempted the kind of hybrid system that CFPB is now aiming to build into federal law. The final rules are years away, but they will likely be modeled on the approach that states like Colorado take: limit the cost of these loans, prohibit the most egregious fine-print tricks lenders use, but make sure this lending remains economically viable so that desperate low-income people have somewhere to turn. The idea that tightly-regulated payday loan shops can be a genuinely valuable service for the poor may need a lot more time to sink in in places like Connecticut that have decided a ban would be better. U.S. Secretary of the Interior Sally Jewell tells MSNBC host José Díaz-Balart, ‘They know their lands better than we do’ when asked about the Keystone XL pipeline. 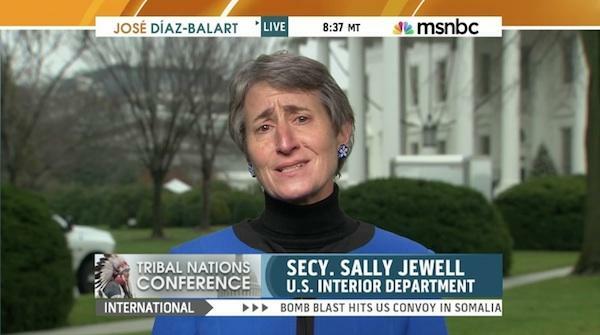 U.S. Secretary of the Interior Sally Jewell invoked not only tribal sovereignty but also environmental expertise when she spoke to MSNBC’s José Díaz-Balart about the Keystone XL pipeline, which many tribes oppose. “I think the fact that the tribal nations are standing up saying, ‘We are concerned about this. We are concerned about water quality. We’re concerned about tribal sovereignty. We’re concerned about what this pipeline may do for our lands and our rights,’ needs to be heard,” she said when he asked her to put tribal opposition to Keystone in context. In the end it will all come down to the State Department, she said, which will make the pipeline decision “by listening to all of the facts and information they have,” including tribal voices. Jewell also spoke about Native youth, the centuries of oppression that have led to the current state of affairs regarding mental health, education and poverty, and on how it is time to make things right. Her full chat with Díaz-Balart can be seen at MSNBC.com. The pipeline threatens many tribal lands, especially Sioux territory in South Dakota, given that the proposed route traverses the Rosebud Sioux Reservation. Last month tribal President Cyril Scott said that if the pipeline passes it would be considered “an act of war,” and promised to fight it all the way. The canoe from Suquamish embarks on this year’s journey to Bella Bella. LITTLE BOSTON — Pullers in the 2014 Canoe Journey are in for a long one, a 500-miler to the territory of the Heiltsuk First Nation — Bella Bella, British Columbia. They’ll be richly rewarded for the experience. They’ll travel through territory so beautiful it will be impossible to forget: Rugged, forested coastlines; island-dotted straits and narrow, glacier-carved passages; through Johnstone Strait, home of the largest resident pod of orcas in the world; along the shores of the Great Bear Rainforest, one of the largest remaining tracts of unspoiled temperate rainforest left in the world. They’ll also travel waters that are increasingly polluted and under threat. Pullers will travel the marine highways of their ancestors, past Victoria, which dumps filtered, untreated sewage into the Salish Sea. They’ll travel the routes U.S. energy company Kinder Morgan plans to use to ship 400 tanker loads of tar sands oil each year. Canoes traveling from the north will pass the inlets leading to Kitimat, where crude oil from Enbridge’s Northern Gateway pipeline would be loaded onto tankers bound for Asia; Canada approved the pipeline project on June 17. 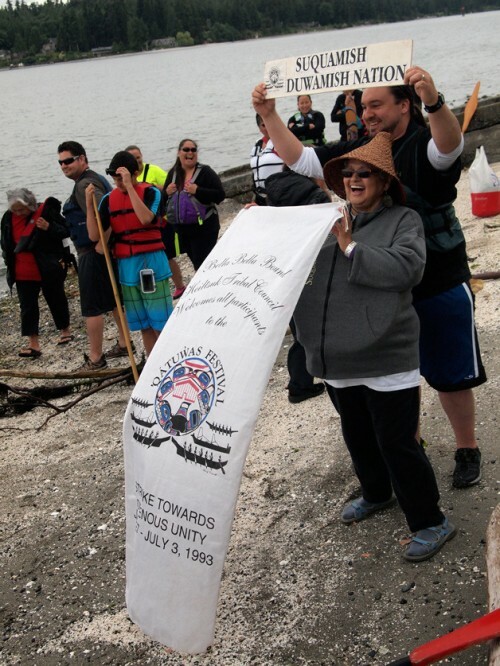 Canoes from the Lummi Nation near Bellingham will pass Cherry Point, a sacred and environmentally sensitive area where Gateway Pacific proposes a coal train terminal; early site preparation was done without permits and desecrated ancestral burials. “Come with me to the emerald sea / Where black gold spills into my ocean dreams. Native leaders hope the Canoe Journey calls public attention to the fragility of this environment. “We need to wake up to what’s happening to Mother Earth,” said Cecile Hansen, chairwoman of the Duwamish Tribe and a great-great-grandniece of Chief Seattle. Suquamish Chairman Leonard Forsman is pulling in the Suquamish canoe to Bella Bella. Micah McCarty is a former chairman of the Makah Nation and a member of the board of First Stewards, which seeks to unite indigenous voices to collaboratively advance adaptive climate-change strategies. He sees the Canoe Journey as an exercise in Tribal sovereignty, particularly in the realm of environmental education. U.S. v. Washington, also known as the Boldt decision, reaffirmed that Treaty Tribes had reserved for themselves 50 percent of the annual finfish harvest; a later court decision extended that to include shellfish. In addition, Boldt established the state and Treaty Tribes as fisheries co-managers. “The state-Tribal co-management relationship relative to … US v Washington is more effectively built on Tribal governments assuming more and more of the federal trust responsibility in the spirit of self-governance and by directly investing in Tribally determined education,” he said. The Canoe Journey is itself a tool to monitor the health of the sea. In each Canoe Journey since 2008, in partnership with the U.S. Geological Survey, several canoes carry probes that collect water data and feed the data into a recorder aboard the canoe. The data measures water temperature, salinity, dissolved oxygen, pH and turbidity. The USGS is using the data to track water quality and its effects on ecosystem dynamics. You can read the results from 2008-2013 at http://wfrc.usgs.gov/tribal/cswqp/. It’s the Canoe Journey’s first return to Bella Bella since 1993, when canoes made the long journey north to fulfill a vision of Canoe Journey founders Emmett Oliver and Frank Brown in 1989 after the Paddle to Seattle that was held as part of Washington’s centennial celebration. That 1993 journey sparked a revival in indigenous travel on the marine highways of the ancestors. En route to the final destination, canoes visit indigenous nations along the way, each stop filled with sharing: traditional foods, languages, songs, dances and teachings. Pulling great distances can test physical and mental discipline. Traveling the way of the ancestors can be a spiritual experience, and songs often come to pullers on the water. This journey will be as challenging as the 1993 journey. From Little Boston, canoes travel west to Port Angeles, then cross the Strait of Juan de Fuca to Vancouver Island. They’ll travel north along the east side of the island to Port Hardy, then cross big water from Vancouver Island to the B.C. mainland. As they head north, they’ll pull through passages and channels and will have to time each transit right so they’re not pulling against tides. 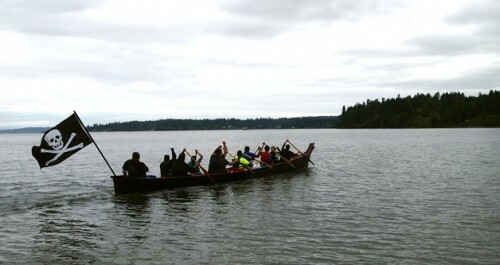 More than 100 canoes participated in last year’s journey to the Quinault Nation. The distance and isolated destination in this year’s journey requires a month off for peninsula and South Sound pullers and support crews. Heiltsuk is expecting 54 canoes. Three Suquamish canoes and one Nisqually canoe departed from Suquamish on June 17, moored overnight in Kingston, then arrived at Point Julia on June 19. Those canoes and one from Port Gamble S’Klallam will depart for Jamestown S’Klallam on June 20, then meet up with canoes from Pacific Coast Tribes at Elwha Klallam. Canoes will cross the Strait of Juan de Fuca on June 22 for Vancouver Island and points north. All are scheduled to arrive in Bella Bella on July 13. Among those traveling part of the journey: Marylin Bard of Kingston, Emmett Oliver’s daughter. She will travel in a five-person river canoe that was gifted to her father by the Quinault Nation last year. Get more information about the 2014 Canoe Journey/Paddle to Bella Bella: www.tribaljourneys.ca. I will leave it to others to answer that question, but, supposing the Kingdom coexists with the State of Hawaii, what tax and public finance implications can we expect? Throughout its history, the U.S. government has had to coexist with independent sovereign entities known as Native American tribes. During this time, rules and procedures have been adopted allowing both to exist with a fair amount of autonomy and dignity for each. 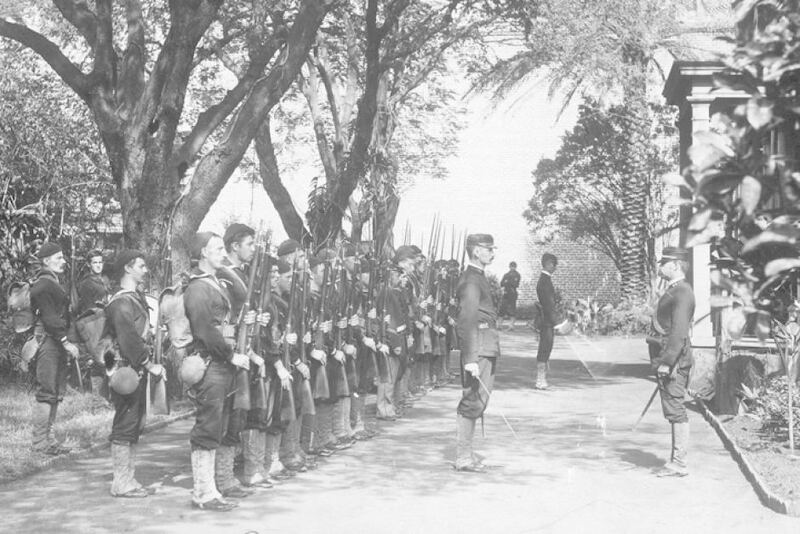 The Akaka Bill aimed to reconstitute a Native Hawaiian governing entity and then have it recognized by the federal government the same way Native American tribes are. Typically, tribes have space set aside within a state, which we call a “reservation.” On the reservation, the tribal government not only provides governance, but also provides the services necessary to maintain a civilized society. Those services, like any others provided by any other government, need to be paid for. So the tribal government has the power to impose taxes upon those living on the reservation. Those on the reservation pay tribal taxes, not state or federal taxes. But neither the state nor the federal government is obligated to provide the reservation with infrastructure, police, fire protection, a militia, or anything else people typically look to government to provide. By the same token, anything off the reservation is part of the state. An individual living off the reservation, even though ethnically or otherwise a member of a tribe, is considered a state resident and pays federal and state taxes like any other resident. This makes sense because that person is a beneficiary of the services and society provided by the federal and state governments, and should pay for those services like any other person living there. The same theories apply for the island possessions of the United States, such as Guam and American Samoa. Each island has a government that imposes its own tax and provides its own services. For example, those living in Guam pay Guam tax, while ethnic Guamanians living in the U.S. pay federal and state taxes. Applying these concepts to the Native Hawaiian situation raises familiar issues. The Kingdom of Hawaii currently has neither a monarch nor anything generally recognized by its members as a government. That’s why the Akaka Bill proposed, and the Native Hawaiian Roll Commission is moving toward, a process for getting a number of Native Hawaiians together and having them organize themselves. Once that happens, however, some kind of dedicated space is needed for the nation-within-a-nation model to work. We certainly hope that no one is thinking the citizens of the reconstituted Kingdom living on state lands, and taking advantage of the benefits and services offered by the state and federal governments, will then claim they don’t have to pay for them. That’s simply not reasonable. People paid taxes in the old Kingdom, and those in the reconstituted Kingdom shouldn’t expect something different. We all need to be aware that both benefits and burdens flow from being a part of civilized society. Tom Yamachika is interim president of the Tax Foundation of Hawaii. Since 2006, Northwest Indian College (NWIC) has honored the life and work of one of Indian Country’s most recognized and respected leaders by hosting the Annual Vine Deloria, Jr. Indigenous Studies Symposium. In his lifetime Deloria, a Sioux scholar, was an advocate for tribal sovereignty, Executive Director for the National Congress of American Indians, a professor, an activist for social justice, a critic of western science and society, a champion of Indigenous values, and wrote nearly 25 books and 200 published articles. The purpose of the symposium is celebrate and continue Deloria’s work by bringing together Native and non-native scholars, tribal elders, traditionalists, and others who are interested in honoring the causes Deloria devoted his life to, and building upon the foundation he and others helped build. The symposium is organized as a series of intellectually driven panels – no workshop-type presentations. Individual presentations may be formal or informal, but in keeping with the spirit of Deloria, there will be no PowerPoint or other electronic presentations. Bobby Bridger will be delivering the Vine Deloria, Jr. address at the 9th annual symposium. Past keynote speakers have included Billy Frank, Jr., Hank Adams, Oren Lyons, Suzan Shown Harjo, Tom Holms, and Hennrietta Mann. Registration costs $150, which will cover continental breakfasts and lunches each day of the event and a celebratory salmon dinner. Hotels fill up fast during the summer, so book your reservation soon. Small blocks have been reserved for symposium attendees at the Silver Reef Casino (five minutes from NWIC’s campus) and the Hampton Inn (ten minutes away). The Silver Reef can be reached at (360) 383-0777 and the Hampton Inn at (360) 676-7700. To receive a special rate, be sure to say you are with the Vine Deloria Symposium when you book. For more information or to register, contact Angel Jefferson at (360) 392-4287 or ajefferson@nwic.edu. The CEO of the Hawaiian Affairs Office (OHA) has retained his job and gained public support to challenge the US on whether the Kingdom of Hawaii still exists as a sovereign country. 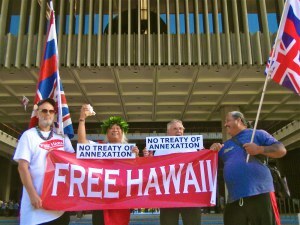 Kamanaopono Crabbe sparked an internal crisis when he sent a letter to US Secretary of State John Kerry, asking for a ruling on whether the Kingdom of Hawaii still legally exists. The letter, which was quickly rescinded by the OHA’s trustees, was prompted by the US Government’s acknowledgment that the overthrow of the kingdom in 1893 was illegal. Political scientist Dr Keanu Sai, from Windward Communtiy College in Honolulu, told Pacific Beat the OHA board thought Dr Crabbe had violated their policy by sending the letter without approval, but later realised they were mistaken. “[Dr Crabbe] was not in violation of any policy of the board but rather was operating on his diligence and risk management,” Dr Sai said. Mr Crabbe has now won the support of the OHA trustees, who have moved to send the letter again and retain him in his role as CEO. Public support for Mr Crabbe’s campaign is also growing, with 2,500 people signing an online petition. Dr Sai said Hawaiians need clarification on the issue. “What was overthrown was the government, not the country,” he said. Dr Sai blames revisionist history education for misconstruing local understanding of Hawaii’s true status. “A revisionist history has been taught here in Hawaii since the early 1900s that presented Hawaii as if it was a part of the United States when in fact there is clear evidence that it’s not,” he said. Dr Sai says if the Kingdom of Hawaii does indeed still exist, many historical treaties with nations including the UK and Australia would still be in effect. The US may be in violation of international law if Hawaii is still technically its own country. The US would be guilty of appropriating funds by taxation and other related crimes, by not complying with occupation laws. Dr Sai says within the framework of international law, there is presumed of continuity of a country when it is established. “All that needs to be provided is evidence that Hawaii was a country (and it was, fully recognised by the United States and Great Britain and everyone else),” he said. “It places the burden upon the United States to provide overwhelming evidence that it in fact extinguished Hawaii as an independent state under international law. South Dakota’s nine Indian reservations exist as sovereign nations. But what does that mean? KSFY News talked with tribal, state and federal leaders about what it means to lead a nation within a nation. Sovereignty may seem easy to define on paper, but in practice, it’s complicated. To some, it’s a feeling. A way of life. “Sovereignty, to me, is something our grandfathers gave us. That we need to respect, because it’s a tool that protects us here in Indian Country,” said Rosebud Sioux Tribe President Cyril Scott. It’s a way of life that involves an ongoing power struggle, colored by a history of eradication. “The states, the government, they want to take that sovereignty away from us. They don’t want to acknowledge that Adolf Hitler got his ideas from the United States,” said Crow Creek Sioux Tribe Chairman Brandon Sazue. For tribal governments, sovereignty comes with a limited autonomy. “When you look at South Dakota, we’re unique in a sense that we have nine different tribes that through treaties and congressional action enjoy a level of tribal sovereignty. That means they have the ability – while they are certainly South Dakotans – that they have the ability to vote in our elections, but they also have a separate sovereignty that allows them to control certain matters within their borders,” said South Dakota Attorney General Marty Jackley. “We have control of our schools, our courts, our police, so those do make us sovereign, but there’s a lot of things where we are not sovereign. We are still dependent. We are still dependent on the federal government because they have not met their trust responsibility in meeting our needs through economic development,” said Oglala Sioux Tribe President Bryan Brewer. “They gave us the treaties 200 years ago, 100 years ago, however long ago. Did that give us our sovereignty? In a way, it should have. But today, we don’t have sovereignty,” said Sazue. Tribes must follow state and federal laws, which can mean problems when those limits are tested. “For any community in the United States, there are limits. The constitution still needs to be followed and respected. The federal laws still need to be followed and respected,” said South Dakota U.S. Attorney Brendan Johnson. For example, Pine Ridge is looking into the legalization of marijuana within its borders. Jackley says while he respects tribal sovereignty, pot still is illegal. Another limit to tribal sovereignty is who can and cannot be prosecuted in tribal courts. “There are further limitations if there is a non-Indian committing a crime against a non-Indian within the reservation boundaries, the state or the state’s attorney would have jurisdiction over that,” said Jackley. “I believe we’re going to start arresting everybody. Non-Indians. If they commit a crime on a reservation, we’re going to arrest him, take them through our courts and see what happens. We know it will go to the Supreme Court, but we want to test it, we want to test our sovereignty and we talk about our sovereignty. We’re going to test it through the judicial system,” said Brewer. “We’re seeing tribal courts strengthened. We’re seeing police departments growing and I think that’s very good, because I think the future of tribal sovereignty means more local control for the tribes, less involvement from federal government,” said Johnson. According to Brewer, many families living in reservation communities depend on the federal government as well, because job opportunities are few and the cost of utilities like propane and electricity are high. A recent emphasis on economic development and inter-tribal trade aims to change that. “The future of tribal sovereignty, I think, is about creating alliances. Sovereignty is strongest when you’re using it to create alliances, and I think in South Dakota we’re starting to see that now,” said Johnson. South Dakota’s tribes are working on many fronts to become more independent. Wind energy will help cut down on the high cost of electricity. Several tribes have projects in the works. The launch of dozens of tribe-operated businesses – like Lakota Popcorn on Lower Brule and Tanka Bars on Pine Ridge – are helping to alleviate the unemployment problem. Many tribes are also putting an increased emphasis on tourism. For example, the Oglala Sioux will likely become the first tribe to operate a national park in the Badlands’ South Unit. While tribes are using the increasing connectedness of our world for the betterment of their people, assimilation and eventual obscurity aren’t part of the plan. 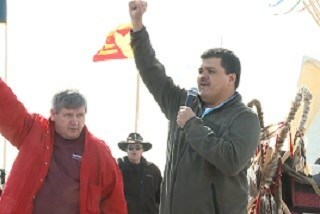 “What we are telling the people of the United States and the state of South Dakota – we are a nation. The first nation of this country,” said Scott.